If you are reading this article, there's a strong chance it's been decades since you last saw the Declaration of Independence, let alone read it. If you are under 40, those chances are even greater. Yet today, many people have a vague understanding of conditions leading up to the Revolution, even the lack of who we fought. You'll find a very good and concise summary here. It's definitely worth a read. Or you can skip to the content of the Declaration below (also in text). But when a long train of abuses and usurpations, pursuing invariably the same Object evinces a design to reduce them under absolute Despotism, it is their right, it is their duty, to throw off such Government, and to provide new Guards for their future security.--Such has been the patient sufferance of these Colonies; and such is now the necessity which constrains them to alter their former Systems of Government. The history of the present King of Great Britain is a history of repeated injuries and usurpations, all having in direct object the establishment of an absolute Tyranny over these States. To prove this, let Facts be submitted to a candid world. Nor have We been wanting in attentions to our Brittish brethren. We have warned them from time to time of attempts by their legislature to extend an unwarrantable jurisdiction over us. We have reminded them of the circumstances of our emigration and settlement here. We have appealed to their native justice and magnanimity, and we have conjured them by the ties of our common kindred to disavow these usurpations, which, would inevitably interrupt our connections and correspondence. What Happened to Those Who Signed The Declaration? Those last words were very important to the 56 who signed the Declaration. A look at the historical record shows their pledge to be indisputable. Of those who signed the declaration, 12 fought in battles as members of state militias, five were captured and imprisoned during the Revolutionary War, 17 lost property as a result of British raids, and five lost their fortunes in helping fund the Continental Army and state militias battle the redcoats. Thomas Heyward Jr. of South Carolina was a signer of both the declaration and the Articles of Confederation. Heyward drew the ire of the British when, as a circuit court judge, he presided over the trial of several loyalists who were found guilty of treason. The prisoners were summarily executed in full view of British troops. In 1779, he joined the South Carolina militia as a captain of artillery. Heyward’s compatriot in the South Carolina delegation, Edward Rutledge, also served in the state militia. At age 26, Rutledge was the youngest signer of the Declaration of Independence. After returning home from attending the Second Continental Congress in 1777, he joined the militia as captain of an artillery battalion. Both Heyward and Rutledge aided their country in the battle at Port Royal Island, where they helped Gen. Moultrie defeat British Maj. William Gardiner and his troops. Arthur Middleton, the last of the South Carolina delegation who served in the militia, took up arms against the British during the siege of Charleston in 1780. His fellow signers, Heyward and Rutledge, fought in that battle as well. Upon the surrender of Charleston, all three men were captured by the British and were sent to a prison in St. Augustine, Florida, which was reserved for people the British thought were particularly dangerous. They were held there for almost a year before being released. On route to Philadelphia for a prisoner exchange in July 1781, Heyward almost drowned. He survived his fall overboard by clinging to the ship’s rudder until he could be rescued. During the British occupation of Charleston, Commandant Nisbet Balfour ordered the seizure of many estates in Charleston, including those owned by Heyward and Middleton. During his imprisonment, Heyward’s wife died at home, and his estate and property were heavily damaged. Rutledge’s estate was left intact, but his family had to sell many of their belongings in order to make the trip to Philadelphia to reunite with him after his release. Middleton’s estate was left relatively untouched, but his collection of rare paintings was destroyed during the British occupation of his home. Thomas Nelson Jr. of the Commonwealth of Virginia was appointed to the position of brigadier general and commander-in-chief of the Virginia militia by Gov. Patrick Henry in August 1777. At that time it was thought that the British would be making a full scale invasion of the state. Nelson was able to muster only a few hundred men to defend Virginia, but the British instead decided to attack Philadelphia. Nelson inherited a vast family fortune, much of which he used to support the American effort. He personally paid for the return journey home of 70 troops he had led to meet the British in Philadelphia during the summer of 1778. In the spring of 1780, Nelson signed his name to a loan for $2 million that was needed to purchase provisions for the French fleet that was coming to America’s aid in the war. As then-governor of Virginia, during the Battle of Yorktown he ordered American troops to fire upon his mansion, which had been commandeered by Gen. Cornwallis and his men. A member of the New Jersey delegation, Richard Stockton, had his estate commandeered by the British for use as a headquarters. As they left, British troops burned all his personal effects—including his library, private papers, furniture, and clothes. Though Stockton was in hiding at the time, he ultimately did not escape capture; a traitor led the British to his position in November 1776. He was held captive in Amboy, New Jersey, and was then sent to New York City where he was imprisoned in a jail reserved for common criminals. Incensed by his treatment, Congress worked with British Gen. William Howe to obtain his release. Because of his small build and stature, George Walton was thought to be the youngest of the signers of the declaration (he was actually in his mid-30s). He hailed from Georgia and served as colonel in the first regiment of the state militia in 1778. During the siege of Savannah, a cannonball broke Walton’s leg, which led to his being captured. He was held captive for nine months and was released in the early fall of 1779 in a prisoner exchange for a British navy captain. At the same time Walton was held prisoner, his wife Dorothy was captured by the British. She was imprisoned on an island in the West Indies and was eventually freed after a prisoner exchange. During the Waltons’ confinement, the British ransacked their home. British troops destroyed the home of George Clymer of Pennsylvania in September 1777 when they captured Philadelphia. Though his home was outside of the city, it was right in the middle of the path of the British march. American loyalists pointed out to the British homes belonging to patriots, which of course included Clymer’s estate. Clymer also contributed to the war monetarily. He converted his entire fortune into continental currency, a risky move considering the likelihood that the currency would be rendered worthless. He also told wealthy friends to contribute to the American cause. A delegate from Pennsylvania, Robert Morris helped insure Washington’s victory at Yorktown by using his own credit to obtain the supplies necessary to defeat the British. He spent more than $1 million (not adjusted for inflation) of his own money to accomplish this. While serving as superintendent of finance of the United States, Morris regularly used his own financial resources to obtain much needed supplies. Using his own funds, for example, he purchased one thousand barrels of flour for Washington’s men in late spring of 1778. Lewis Morris of New York served as a major general in the state militia. Morris devoted himself to recruiting men to serve in the militia and to help keep supplies up, which was a constant problem. For almost the entire length of the war, the British occupied his home, Morrisania, and used it as their headquarters. This forced Morris to live off of his close friends and associates until the war ended in 1783. John Hancock of Massachusetts, the man with the largest signature on the declaration, served in the militia as major general in 1778. Hancock was put in command of approximately 6,000 men during the Rhode Island campaign. That campaign was ultimately unsuccessful because the French failed to carry out their end of the bargain. Caesar Rodney served in the Delaware militia as well, attaining the rank of brigadier general. Rodney famously road on horseback straight from Dover to Philadelphia to cast his vote in favor of declaring independence (the Delaware delegation was split). He was with his men in the field during the brutal winter of 1776, helped quash an uprising in Delaware (there were a large number of loyalists within the state), and helped in George Washington’s effort to defend Philadelphia from being taken by the British. Carter Braxton of the Virginia delegation accumulated massive personal debts helping the American effort in the war. He loaned 10,000 pounds sterling to Congress, which was never repaid. He also spent much of his wealth outfitting American ships so that they could carry more cargo. Due to the British capturing some of his vessels and others being lost out on the high seas, he suffered great financial calamity. These accumulated losses left him bankrupt by war’s end. A delegate from Connecticut, Oliver Wolcott served as captain and then major general in the state militia. In 1776, he was appointed to lead 14 regiments in defense of New York City. He also commanded thousands of men in the Battle of Saratoga. Wolcott worked tirelessly to recruit for the Connecticut militia, which, like the army in general, was sorely lacking in numbers within its ranks. William Whipple of New Hampshire served as brigadier general in the state militia. He fought against Gen. Burgoyne at the battles of Stillwater and Saratoga (commonly pointed to as the turning point for Americans in the war) in 1777. The following year, Whipple participated in the retaking of Rhode Island. Thomas McKean of Delaware served as colonel in the Delaware state militia. Once McKean was appointed to the office of President of Delaware in 1777, he was targeted by the British (the British captured John McKinley, the previous president). He had to move his family on five occasions because of raids by both the British and local Indian tribes. Francis Lewis of New York signed the declaration on August 2, 1776. Although he was present when independence was declared a month earlier, the New York delegation did not get permission from the state’s legislature to sign the document. A few months after affixing his signature on the declaration, British troops destroyed the Long Island estate of Lewis. They took Lewis’ wife and put her in prison where she was tortured on a regular basis. Under the direction of George Washington, she was finally returned in a prisoner exchange two years later. Known as the sage of Philadelphia, Benjamin Franklin of Pennsylvania was the oldest of the signers of the declaration. Prior to setting sail for France in late 1776 to ask the French for assistance in the war, Franklin gave his entire fortune to Congress to help fund the war. Hessian mercenaries plundered signer John Hart’s 400-acre farm outside of Hopewell, New Jersey. Prior to his farm being captured, Hart was forced to leave his family because of advancing British troops. During his absence, his wife died, and his children were sent to live with neighbors. The estate of William Ellery of Delaware was burned down during the British occupation of Newport, Rhode Island. Ellery served in the Second Continental Congress until the British left Newport, which they held for three years. He returned home in order to salvage what was left of his property. With his fortunes built on trade, Joseph Hewes of North Carolina was a vigorous proponent of the decision of the First Continental Congress to cut off all imports and exports with the British. This of course had the effect of drying up his wealth. Interestingly, Hewes also renounced his Quaker religion in order to support the war. A delegate from Pennsylvania, James Smith served in the Pennsylvania militia as captain, colonel, and then as brigadier general. He was one of the first to raise men for the possibility of defending his home state, a duty he took up beginning as early as 1774. Benjamin Harrison of Virginia, whose son and grandson both served as U.S. presidents, complained in a letter to Gov. William Livingston of New Jersey that his debts had accumulated substantially because of the “ravages” and “plunderings” of the British. While William Floyd of New York served as a delegate in the Second Continental Congress, the British sacked his estate, forcing his family to flee. Though they made it safely to Connecticut, his family was left without a home for the duration of the war. William Hooper of North Carolina outlasted British raiders who were looking to capture him and his family. In 1782, he and his family fled Wilmington after it fell to the British. Though much of his property was destroyed, he and his family were reunited at the conclusion of the war. The British destroyed the home and plantation of Lyman Hall of Georgia. Luckily, his family escaped before the British arrived and moved up North to be with him. 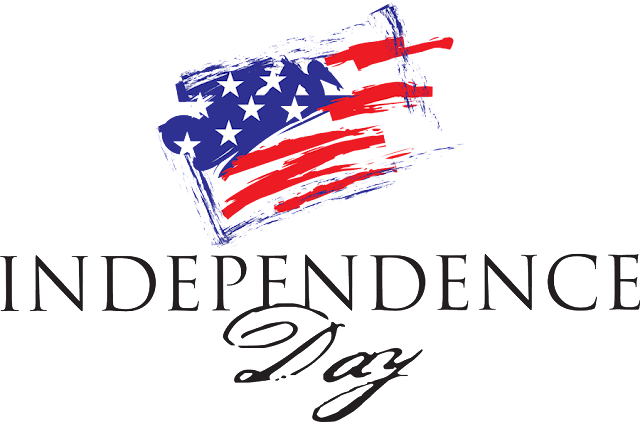 On July 1, 1776, the Second Continental Congress met in Philadelphia, and on the following day 12 of the 13 colonies voted in favor of Richard Henry Lee’s motion for independence. The delegates then spent the next two days debating and revising the language of a statement drafted by Thomas Jefferson. 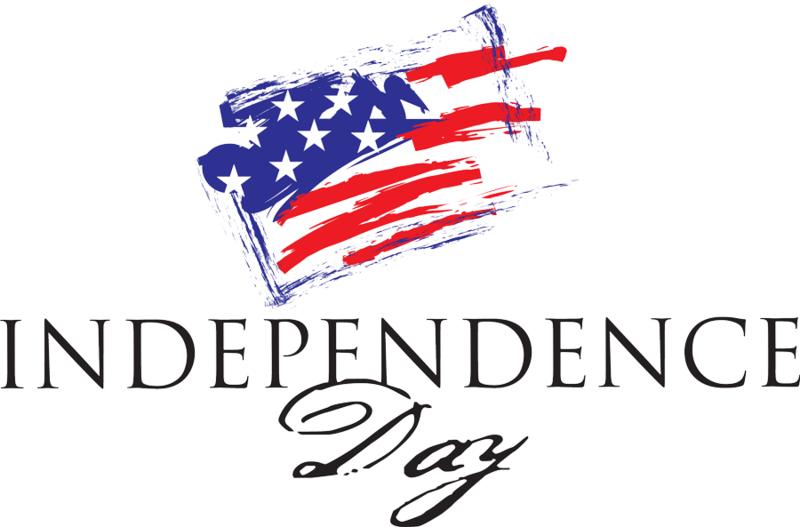 On July 4, Congress officially adopted the Declaration of Independence, and as a result the date is celebrated as Independence Day. Nearly a month would go by, however, before the actual signing of the document took place. First, New York’s delegates didn’t officially give their support until July 9 because their home assembly hadn’t yet authorized them to vote in favor of independence. Next, it took two weeks for the Declaration to be “engrossed”—written on parchment in a clear hand. Most of the delegates signed on August 2, but several—Elbridge Gerry, Oliver Wolcott, Lewis Morris, Thomas McKean and Matthew Thornton—signed on a later date. (Two others, John Dickinson and Robert R. Livingston, never signed at all.) The signed parchment copy now resides at the National Archives in the Rotunda for the Charters of Freedom, alongside the Constitution and the Bill of Rights. 2. More than one copy exists. After the adoption of the Declaration of Independence, the “Committee of Five”—Thomas Jefferson, John Adams, Benjamin Franklin, Roger Sherman and Robert R. Livingston—was charged with overseeing the reproduction of the approved text. This was completed at the shop of Philadelphia printer John Dunlap. On July 5, Dunlap’s copies were dispatched across the 13 colonies to newspapers, local officials and the commanders of the Continental troops. These rare documents, known as “Dunlap broadsides,” predate the engrossed version signed by the delegates. 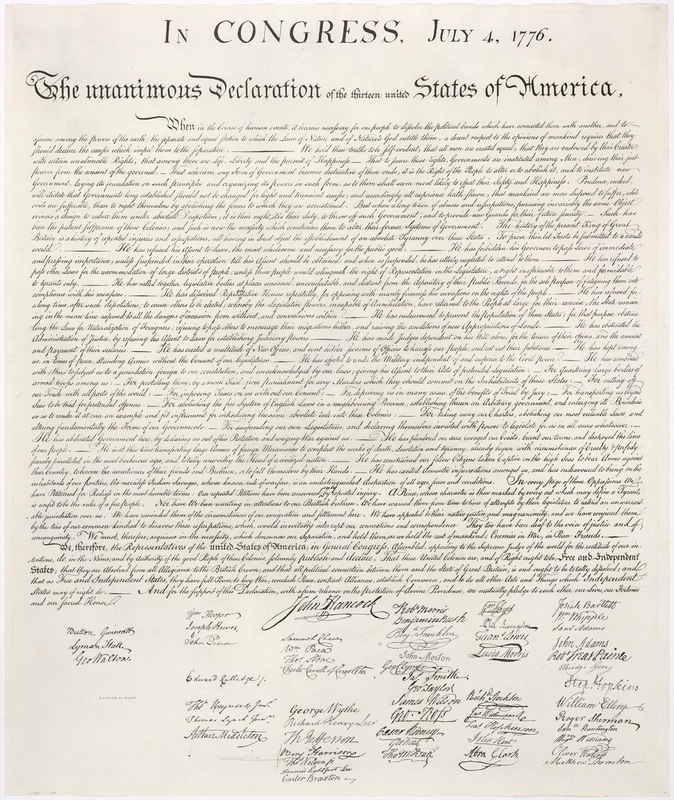 Of the hundreds thought to have been printed on the night of July 4, only 26 copies survive. Most are held in museum and library collections, but three are privately owned. 3. When news of the Declaration of Independence reached New York City, it started a riot. By July 9, 1776, a copy of the Declaration of Independence had reached New York City. With hundreds of British naval ships occupying New York Harbor, revolutionary spirit and military tensions were running high. George Washington, commander of the Continental forces in New York, read the document aloud in front of City Hall. A raucous crowd cheered the inspiring words, and later that day tore down a nearby statue of George III. The statue was subsequently melted down and shaped into more than 42,000 musket balls for the fledgling American army. 4. Eight of the 56 signers of the Declaration of Independence were born in Britain. 5. One signer later recanted. Richard Stockton, a lawyer from Princeton, New Jersey, became the only signer of the Declaration of Independence to recant his support of the revolution. On November 30, 1776, the hapless delegate was captured by the British and thrown in jail. After months of harsh treatment and meager rations, Stockton repudiated his signature on the Declaration of Independence and swore his allegiance to King George III. A broken man when he regained his freedom, he took a new oath of loyalty to the state of New Jersey in December 1777. 6. There was a 44-year age difference between the youngest and oldest signers. The oldest signer was Benjamin Franklin, 70 years old when he scrawled his name on the parchment. The youngest was Edward Rutledge, a lawyer from South Carolina who was only 26 at the time. Rutledge narrowly beat out fellow South Carolinian Thomas Lynch Jr., just four months his senior, for the title. 7. Two additional copies have been found in the last 25 years. In 1989, a Philadelphia man found an original Dunlap Broadside hidden in the back of a picture frame he bought at a flea market for $4. One of the few surviving copies from the official first printing of the Declaration, it was in excellent condition and sold for $8.1 million in 2000. A 26th known Dunlap broadside emerged at the British National Archives in 2009, hidden for centuries in a box of papers captured from American colonists during the Revolutionary War. One of three Dunlap broadsides at the National Archives, the copy remains there to this day. UPDATE: In April 2017, yet another original copy of the Declaration of Independence was found safely stored in a records office in Southern England. What makes this an historically significant find is that this manuscript copy is on parchment. 8. The Declaration of Independence spent World War II in Fort Knox. On December 23, 1941, just over two weeks after the Japanese attack on Pearl Harbor, the signed Declaration, together with the Constitution, was removed from public display and prepared for evacuation out of Washington, D.C. Under the supervision of armed guards, the founding document was packed in a specially designed container, latched with padlocks, sealed with lead and placed in a larger box. All told, 150 pounds of protective gear surrounded the parchment. On December 26 and 27, accompanied by Secret Service agents, it traveled by train to Louisville, Kentucky, where a cavalry troop of the 13th Armored Division escorted it to Fort Knox. The Declaration was returned to Washington, D.C., in 1944. 9. There is something written on the back of the Declaration of Independence. In the movie “National Treasure,” Nicholas Cage’s character claims that the back of the Declaration contains a treasure map with encrypted instructions from the founding fathers, written in invisible ink. Unfortunately, this is not the case. There is, however, a simpler message, written upside-down across the bottom of the signed document: “Original Declaration of Independence dated 4th July 1776.” No one knows who exactly wrote this or when, but during the Revolutionary War years the parchment was frequently rolled up for transport. It’s thought that the text was added as a label. If you enjoy US History, visit The Founders Online library of historical document at the National Archives website.